The Early Years I first became aware of color and light therapies in the mid 1970”s. There were a few budding alternative therapists among my circle of friends and I wanted to get in on some of this incredible information. My areas of focus, in the time I had available, were on color therapy and Iridology. I studied the works of Dr. Edwin Babbitt, Dr. Kate Baldwin, Victor Dane, Osborne Eaves, Roland Hunt, Walter Russell, and others, to try to get a sense of consistency and practicality out of what seemed to border on the ‘mystical” . Many early color theorists based their work on channeled information or mystical teachings brought from India and which were based on aura or chakra colors. Some of the information from one book would be directly opposed to that in another. In addition, the application of color to the body usually involved the shining of colored light on specific sections of the body for long periods of time (up to 2 hours), or consuming water which had been placed in colored glass. However in addition to its historic background and the number of books published on the matter, there was an impressive number of people who had recovered from symptoms as a result of color and light therapy. Of course, even for most people today, this seems a bit “fantastic”. I dabbled with colored light on various occasions, as well as with iridology, but had problems with their lack effectiveness. Yes, there was definitely something to them, but there was enough wrong for me to become frustrated. It wasn’t till the early 1990’s that both areas took a dramatic shift. I had learned of an international research group that was involved in European iridology research from Italy, Germany, England, Russia, and France. Valid research by medical doctors had been ongoing in those countries whereas very little, if any had been done in the United States due to its complete disapproval by the AMA. When most American iridologists were interviewed, they simply did not have proper or adequate training to address real health issues with much more than theory. There was some research that was being done in Italy and France on the iris of the eye that really got my attention. A few medical doctors were applying pulsed and colored light to the iris , which is an extension of the brain – and noting various responses in the iris as related to the Autonomic Nervous System. There were also certain implications that the whole body might be accessed in this way. This was great information. I wanted to experiment on myself, but to do it I would need a device that could deliver pulsed and colored light to the iris via optic fiber which would not be damaging to the eye. I worked with a few electronics engineers who only promised to be time consuming and expensive, but what I wanted was simplicity, elegance, and not have to spend a huge amount. After giving up completely I accidentally found the light source I was looking for, and it wasn’t long before I had a device I could work with. I called it the Photon Stimulator Synchronistic Developments Now here is another incredible connection; I married an acupuncturist (Anna). Since we were married I had gotten very interested in the concepts, and theories of acupuncture. I even produced an educational video for the public entitled Acupuncture and You. It was not a great stretch to apply the pulsed and colored light to acupuncture points. I certainly was not the first to do it, so I researched what I could, and what I found was awe inspiring. The results of the use of the Photon Stimulator on the iris of the eye at the time proved to be a bit unruly, and was certainly not something I would practice on someone else. I didn’t have enough information to use it in any effective and predictable way on the iris. However the device was ideal for use on acupuncture points, and completely safe. By now I had use of the internet, and my research led me to some work done in the late 1970’s at the Institute for Clinical and Experimental Medicine in Novosibirisk, Russia published in Raum and Zeit , a German research magazine. It stated that acupuncture meridians were the only place on the body that let light in other than the eyes, and that the meridians acted like optic fiber. This information led me to improve my light device further. We tried it out on ourselves, and were very impressed. I built a few more units and continued to get positive feedback from other acupuncturists. Research in Lyons, France by Dr.s Paul Nogier, and René Bourdiol demonstrated that meridian systems, as well as the Autonomic Nervous System were quite easily and predictably accessed by auricular (ear) acupuncture. Their research gets quite detailed in terms of colors, and pulse rates. Dr. Paul Nogier used this information to evaluate individual response levels based on changes of the vascular system (VAS- Vascular Autonomic Signal)). Development of the Photon Stimulator Each component of the light device is very important: light source, colors, optic fiber, application tip, and pulse rate. Light Source: I wanted to use the best available light source and without any doubt it was Xenon. Our bodies evolved with full spectrum light. Dr. Ott discusses in his book Light, Radiation and You: How to Stay Healthy, some of the problems which we can develop if we are deprived of full spectrum light. The closest available light source to sunlight is Xenon, which is why it is used by photographers. It is color balanced, bright, has a wide spectral distribution, and the bulbs are long-lived. In addition it is one of the Nobel Gases (also called rare or inert) which are completely balanced in their number of electrons, protons and neutrons. They do not easily react or combine with other elements, and were once part of the atmosphere. Xenon is the most rare of the inert gasses – less than 1 part per ten million in the atmosphere. It is made up of very large atoms and it is unusual for such a huge atomic weight to be in gaseous form at room temperature. The choice of a xenon strobe was excellent. Peter Bros in his book Light, Replacing Three Centuries of Misconceptions, explains how light is made up of particles of the particular source which is combusting. Thus the light from tungsten would carry with it particular qualities or effects attributable to tungsten – especially when reacting with biological matter. The same is true for any light source, be it neon, xenon, halogen, laser or diode. The positive information in favor of xenon was just too overwhelming to ignore. Pulsed xenon plasma gas tubes were not just the best choice, but were easily available and cost effective. Colors: Now that I had the best light source, I wanted to use the best colors. My research led to a review of contemporary physics’ viewpoint of what light is. Now I question the basic tenets of institutionalized physics – be it gravity, light, the red shift, or biophysics, and these discussions go far beyond the scope of this article. We are currently experiencing great quakes in the foundations of scientific thought. I eventually concluded that quite a bit of hands-on research would be needed to determine what colors would be best to interact with the human body to produce therapeutic effects. That was beyond my ability, so I looked to others for the most researched color system available. The Spectro-Chrome system of colors developed in the early 1900’s by Dinshah Ghadiali was not only the most researched, but was also widely used and demonstrated to be effective by medical doctors in the United States prior to 1945. Due to the efforts of his son Darius, this system has currently regained the popularity it once had, but not with medical doctors. Dinshah’s research was based on the results of others before him, ending in a comprehensive study of the effects of 12 very specific color filters on the human biological organism. Each element such as oxygen or hydrogen has a dominant spectral wave (color), and a corresponding action on the body. By applying the spectral waves of elements directly to the body, therapeutic results were achieved. Over a period of time therapeutic consistencies were noted and recorded in a 1500 page authoritative treatise on color therapy, the Spectro-Chrome Metry Encyclopedia. Although I had become aware of various schools of color theory, there were none which discussed the effects of specific spectral waves. It was common to see colors such as “violet” or “blue” given particular attributes, but without any awareness of their particular dominant wavelengths or effects. In chapter nine of Darius Dinshah’s book Let there Be Light, he explains how his father used the spectral fingerprints (similar to the Fraunhofer emission lines) of elements to develop the Spectro-Chrome color filters. These were broad band filters and not mono-chromatic because the emissions of ionized elements are in fact a broad band fingerprints. The devices which Dinshah built allowed an intense light to pass through glass filters, and onto exposed areas of the patient’s skin for an hour or so. Later the same color frequencies were reproduced by Rosco Laboratories in thin translucent plastic sheets. For the purposes of my device, I simply cut them to fit 35mm slide casings. The Photon Stimulator has a slot which allows the slides to be easily inserted or removed between the light source and the optic fiber. The exposure time is less than a minute on each point when colored light is placed directly on acupuncture points, rather than shining light on broad areas of the skin from a distance. This makes the application of light to the body very fast and user friendly. Laser light is monochromatic in that it has a very narrow spectral bandwidth, and there are currently a number of devices which use cold lasers on the body for treating very specific problems such as scar tissue, and pain. However, the body did not evolve with monochromatic light, and there is some evidence that prolonged use of cold laser light on acupuncture points reduces their ability to remain “open” at the surface of the skin. The body must also “scatter” or make incoherent, the laser light. This is called the “Monte Carlo Effect” and it happens in most biological systems. LED’s or Light Emitting Diodes are not monochromatic, in that they do not have a narrow spectral bandwidth. The bandwidths that are given for LED’s are the “mean” of the complete spectral bandwidth for that specific color emission. The creation of a narrow bandwidth of 10-15 nanometers requires the use of a band narrowing filter, and this reduces the available brightness considerably, thus requiring a high intensity light source. LED’s are used in a number of color therapy applications, primarily because their pulse rate is able to be controlled electronically up to very high frequencies. In those type of therapies it seems that the pulse rate is more important than the color or light source. Optic Light Guide and Application Tip: To apply the colored xenon light to acupuncture points it would be best to use a relatively small diameter single strand optic light guide that would be able to accommodate usage on micro acupuncture systems such as the ear as well as the body meridian points. I chose a 2.8 mm diameter which works excellently well on all locations. In addition, a six foot length of the optic fiber allows ease of operation. Any longer and it predisposes the device and user to fumbling and tripping accidents, and any less makes it difficult to use it on an adult while lying down. The 6′ of optic light guide makes it incredibly easy to approach and place it on any point without having to manipulate a cumbersome light source. The end of the optic light guide is encased in a comfortable pen-like handpiece. This allows the user to easily place the tip precisely at any desired location. Pulse Rate: pulsing the light signal enhances the effects of the color frequencies, and allows for an additional variable in addressing biological systems. Biological researcher James L. Oschman,PhD., in his new book Energy Medicine: The Scientific Basis, explains how researchers since the 1970’s have found the emissions from the hands of healers to average 7-10 Hz (scanning). Also, their brain wave activity averaged about 7.8 -8 cycles per second and became synchronized with the earth’s geoelectric micropulsations – the Schumann Resonance (caused by a wave effect of lightening striking the earth on an average of 200 times per second, between the surface of the earth and the outer ionosphere). Oschman describes that “…this entrainment may enhance the evolutionarily ancient communication and regulatory systems involved in healing.” In one experiment at the Max Planck Institute in Germany (1968) it was found that a very weak 10 Hz field is the only field that dramatically restored normal patterns to subjects which had been shielded from natural external rhythms for an extended period of time. Our entire biological system consists of an array of antennae which is incredibly sensitive to micro emissions. It had to evolve with internal supersensitivity, because the “loud” noises in our environment were too random and overwhelming for the organism to differentiate what it needed to survive. Light and color as a means of affecting body systems is discounted by most medical practitioners because they view it as too subtle but we are discovering that the body’s microsystems react to very tiny windows and bandwidths of energetic information. 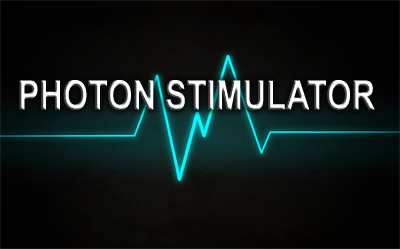 The Photon Stimulator is designed to have an approximate variable pulse rate of between two and ten pulses per second. This allows it to have the added features of being able to entrain certain physiologic functions, and to reinforce the effects of the earth’s resonance on the body. The Patent: the final version of the device was better than I could have imagined. In order to avoid anyone from keeping me from making them, I decided to apply for a patent. I knew it would be a long slow road, but I believed that a device like this would be incredibly valuable for many people to use on themselves, and as a research device. Since fiber optic was only around since the mid seventies, I did a patent search on the web, and became aware of every light and color device that was designed for therapy. I did most of the work on it myself, including the drawings. After the first rejection I hired a semi-retired patent attorney who walked it through the rest of the way. It has Patent Number 5,843,074. as of Dec 1, 1998. Economics always comes into play, and I saw that a number of individuals designed very difficult and expensive devices – possibly for corporations. Full spectrum light (although it is most human-friendly) is hardly marketable due to its abundance. Lasers, Ultraviolet, and Infrared devices dominate the market. There are a variety of other color and light systems available for use on the body, and I must make one distinction. Some systems are based on theory alone. By now in the discussion we know that all colors and light sources are not equal in the actual effects they have on the body. By taking a “cool” color or a “primary” color and applying it to the body using traditional Chinese acupuncture theories for “stimulating” or “tonifying” effects etc., sounds great, and because it involves the application of light to the body, there will be some results – even impressive results at times. But we now have enough contemporary science to supply us with solid empirical outcomes concerning the interaction of light, chemical, nerve, magnetic, electric and energetic interactions with and within the meridian system. In fact the meridian system is no longer the exclusive domain of Chinese medicine or acupuncture. We no longer need to rely on three thousand year old theories to avail ourselves of this incredible reality. This is not to deny the importance or value of Traditional Chinese Medicine. Evolution of Meridians: The word “chi” which is used traditionally to describe the elusive and mystical energy that travels through the meridians has made it difficult for westerners, and even acupuncturists to really grasp what was happening when needles were placed in acupuncture points. The definition of what constituted a “meridian” is often brushed aside in conversation and left for the philosophers to haggle over. Peter Bros, in another of his books The Cooling Continuum: The Rise and Fall of Species on Earth, describes the process of the development of plant life and its evolution into ambulatory animate matter. Again it is the sun that provides the stimulation for life itself, but without the spin of the earth which gives us night and day, there wouldn’t be any life as we know it. It would be frozen or baked. As the earth spins, electrons flow outward during the day, and inward at night. Blossoms open and close allowing the outward flow, and corresponding inward flow. Electron pathways as a result of light are formed in the most primitive forms of all living matter (plant meridians). These “flows” become encased (skin or shells) within the biology of the living organism as it attempts various evolutionary feats – such as movement to extend the range of survivability. It is something that is inherent in the formation of matter around the energetic flows that give it animation – and these flows will always remain. They are the pre-neural, pre-cognitive, and pre-brain development meridians. A few years ago my wife Anna arranged for Dr. Wu, a Qigong master and Doctor of Oriental Medicine, to come to our town in Arizona and teach. One of his discussions led to the meaning of the Yin/Yang symbol “ [ .“ He described the light and dark areas as day and night, and the two dots as the sun and the moon. Yes, the source of the meridians, and vast other implications all exist in that eloquent symbol. So why not attempt to address the issues of repair and injury with the same energetic source that initiated and maintains our evolution – full spectrum light placed directly on meridians. Now, for the first time in history, a device is available which is specifically designed to achieve meridian balance and energetic nourishment. Current Research: James Oschman,Ph.D., in his article Exploring the Biology of Phototherapy, recently published in the Journal of Optometric Phototherapy, describes how “the basic work of injury repair and defense is done primarily by individual cells that must sense where they are needed, move there, and then carry out specific activities.” It is the cells ability to sense where they are needed and act intelligently, without the benefit of what we think of as nerves, or brains. Oschman describes the arrangement of connective tissue, cytoskeletons, and nuclear matrices as a structural, mechanical, energetic, and informational continuum which he calls “the living matrix.” It is much like a living crystal with properties of both liquids and solids. Illness is a result of cells not functioning, not receiving important information, or because they have difficulty moving in their environment. The living matrix is active in the reception and transmission of cellular information. Oshman states “…Light-induced waves…are, in principle, capable of being rapidly conducted to every nook and cranny of the body, even to the nuclear matrices and genes located in every cell….” He describes light as producing collective excited states called “solitons”. These solitons have qualities similar to those of tidal waves in nature. “They can be propagated for long distances without loss or dispersion. They achieve propagation of a narrow, stable pulse over long distances without any distortion or energy loss.” Solitons do not follow linear optic fiber-like rules. Their conduction is more complicated and allows for a variety of signals to be processed within the matrix. “The flow of solitons opens gates and switches and organizes dynamic living matrix pathways.” What we see as our physical structure is in fact a result of polarized waves of energy operating via the cellular matrix, the meridians and the connective tissue. Light allows cells to communicate to each other the information that is important to the healing process. Stanford researcher William A Tiller, Ph.D., in his book Science and Human Transformation, states “…we see that, in order for the body to produce a given ensemble of chemicals, there must also be present a given spectral distribution of photons…. we also need a companion family of photons of sufficient intensity to keep the pot bubbling efficiently” He notes that human photoreceptors are not limited to the retina of the eye but are found through every tissue in the body. Flavins, carotenes, melanin, and heme molecules are active photoreceptors, with iron in the hemoglobin acting similar to the way magnesium acts in chlorophyll. Color qualities once again take on very specific functions, in contrast to theory, as a result of research. Tiller and Zheng tested the photon emissions of fingertips , and found that red photon emission “agrees generally with what others have found from mammalian tissue as being attributed to oxidative production of chemical radicals. It is also possible that Qigong masters emit a higher blue and ultraviolet photon flux than do normal individuals.” He lists absorption spectra of major biomolecules – most being in the blue spectra, irrespective of the biological system in which they were located, plant or animal. Medical researcher Norman Shealy, M.D., in the book Light Years Ahead, discusses neurochemical responses to photostimulation through the eyes using red, green and violet and concludes “Light is an adjunct that is cost effective, valuable and useful.” The world of photonics, especially through optic fiber and lasers, has changed every aspect of our lives including communication, travel, surgery, and dentistry. And yet the field of biological photonics is still in its infancy. Light is truly the foundation for science in the future. Uses of the Photon Stimulator: I am very impressed with the many ways this device has been used since it has been available. I make no claims, other than its ability to balance and nourish the body’s meridians and energetic system. If one is ill, has a disease or condition, then they should go to a medical doctor. This is a research device which I have made available to practitioners, and to the public for personal use. If anyone is relieved of any of their symptoms, it may be purely coincidental. Primarily, the Photon Stimulator is used on acupuncture meridians, but how it is used differs according to a variety of paradigms. Not everyone has all the information that I have gathered about light interacting with the body, so justifiably, they are unsure and unconfident about using the device. Traditional acupuncturists have spent years being trained in principles of diagnosis and treatment, and as a result tend to apply those principles to the use of the light device. However, in fact, it is very simple to use. The basic color attributes researched for years by Dinshah are printed in our manual (with permission) – such as Scarlet; kidney and adrenal stimulant. Many practitioners use muscle testing to choose which color is appropriate, and there are many different ways to muscle test a color. One easy way is to have the person hold a color slide on the area in question, and test if the resistance is strong or weak for that color. Then use the color that tests the strongest. The color is then applied to the appropriate meridian for up to a minute in duration, to nourish and balance that meridian. Meridian master points on the body and ears are illustrated in the manual, but detailed acupuncture meridian charts are easily available. In addition we list some excellent source books. Acupuncture microsystems are used almost exclusively by a number of schools of thought. One is auricular or ear acupuncture. This approach has become very popular throughout the world. Microsystems allow access to the whole body. There are Chinese ear points, but a new system of ear points was developed by Dr. Paul Nogier, using a modern means of point detection. The ear point microsystem makes application very easy since clothing does not have to be removed. Also, due to Autonomic Nervous System enervation in the ear, one not only accesses the meridians, but also affects and balances the ANS. Other microsystems that are used are: the hands, the tongue, and the feet. The Chakras are ideal places to use the Photon Stimulator because of their “light” channel connections and their psychoenergetic or superphysical phenomena associated with each center. A number of people have reported dramatic changes especially when the light tip was placed at the Pituitary or Heart centers. It was suggested to me that I use a natural crystal at the tip because of the possibility that it might enhance the light energy somehow. At first I used crystal points from Arkansas, but I was told that they had the wrong spin – so now I make the crystal tip units with Brazilian crystals. I do not have enough personal experience with the crystal tip units to comment about their effectiveness, however those practitioners who muscle test for which units to get, seem to always end up with the crystal tip units. At the beginning of the article I mentioned that some European medical researchers were using pulsed and colored light on the iris of the eye for physical and emotional repair. That research has come a long way. Dr. Pierre Fragnay, (France) has developed a system of applying pulsed and colored light to the iris and the pupil of the eye. In his book La Chromotherapie Irienne, he discusses his discoveries and early successes on patients using Nogier’s VAS response to locate specific areas needing treatment. Other physicians from Russia, Italy, and England are finding that the iris of the eye is, in fact, a chromoreceptor. The Photon Stimulator is perfectly suited for these type of applications which require a small application tip and easy control. Some European practitioners request custom devices with faster pulse rates to accomodate their theories of application. Pulsed and colored light therapy called Syntonics, also treats an array of bodily conditions by way of the eyes. Jacob Liberman, O.D., Ph.D., in his book Light, Medicine of the Future, discusses uses and successes of using syntonics and his own adapted system of treatment. Rather than utilizing a “close up” point of light on the iris or pupil, colored light is projected through a circular opening at a distance of a few feet or more. Again, a number of practitioners asked me to adapt the Photon Stimulator for similar purposes, so I now have a face plate attachment with a 3/4” hole which is interchangeable with the optic fiber face plate to allow light to be broadcast over a distance. By now most of us have become familiar with homeopathic remedies, and the concept that water takes on the energetic signature or fingerprint of the original substance. The higher the frequency, the more subtle and potent the effect. Earlier, we discussed the body as being a “living crystal” which is sensitive to micro-stimuli, and may be why homeopathics work so well in the body. Light as well as water is capable of acting as a carrier beam of information – in fact it may do so in a much more direct manner. Clear Acrylic has the ability to transfer energetic information and is used in a variety of applications. When a remedy is placed in contact with the acrylic tray, and a portion of that tray is placed within the light path, the carrier beam carries with it the energetic imprint of the remedy. Due to the increasing number of individuals with chemical sensitivities, and chronic fatigue etc., who can tolerate very few ingested remedies, this mode of remedy administration is immediate and virtually without side effects. For this purpose I have designed an acrylic tray and make it available as an attachment for the Photon Stimulator. Other devices that demonstrate the effect of light on the body are the Heart Rate Variability Monitor , the Prognos, and most meridian testing devices. The Heart Rate Variability Monitor takes readings from an individual’s heart rate, respiratory rate, pulse and blood pressure. Computer software analyzes subtle changes in terms of the Autonomic Nervous System. We did a number of five minute light applications to master ear points, and points on the iris with the intention of moving the person more into the Parasympathetic. The results were immediately displayed on the screen – movement into the Parasympathetic changed in all parameters. One device involved taking Kirliam photographs of the fingertips. They were then analyzed by computer and assigned readings relative to the individual meridians. It showed the extent that meridians were in or out of balance. We would place the colored light on those meridians that were out of balance, for a total of about 5 minutes, then take another reading immediately. The new readings would consistently show a balancing effect of the prior out of balance meridians. The Prognos is a very new and expensive device developed for Russian astronauts so they could diagnose and treat themselves while in space. Once the meridian system is diagnosed by placing a probe on meridian points, the device treats by using infrared light. We tried balancing the meridians that were under or over stimulated with the Photon Stimulator instead of the built-in infrared light, and again the results were impressive, demonstrating the effectiveness of full spectrum light. The Photon Stimulator is also well suited for all animals and pets. For pets we recommend the book Four Paws and Five Directions, by Cheryl Schwartz, DVM, it is beautifully illustrated with pictures of dog and cat meridians and acupuncture points. Application of the light follows the same principles as with humans. Choose a color by test or by color attribute, and apply it to the affected meridian. I hope I have illuminated the subject beyond the demonstration of my own excitement. We use the Photon Stimulator as a first aid kit – for almost ever health condition we have – from sore muscles and pain, to stings and bites. Full spectrum photon therapy is a safe and effective adjunct to the maintenance and enhancement of health. It is easy to use and available to everyone . Bourdiol, R.J.,1983, Auriculosomatology, Maisonneuve, France, Breiling, Brian J. editor, 1996, Light Years Ahead, The Illustrated Guide to Full Spectrum and Colored Light in Mindbody Healing, Celestial Arts, Berkley, CA. Bros, Peter, 1994, The Cooling Continuum, The rise and Fall of Species on Earth, 1996, Light, Replacing Three Centuries of Misconceptions, Financial Book Partners, Springfield,VA. Cooke, Maurice B., 1983, Einstein Doesn’t Work Here Anymore, Marcus Books, Toronto, CA. Dinshah, Darius, 1996, 3rd edition, Let There Be Light, Dinshah Health Society, Malaga, NJ. Fragnay, Pierre,2000, La Chromotherapie Irienne, Corona Books, UK Hattersley, Joseph G.,2001,The Healing Power of Full-Spectrum Light, Nexus Magazine, July- Aug, 2001 Hunt, Roland, 1971,The Seven Keys to Colour Healing, C.E. Daniel Company LTD., London, UK. Liberman, Jacob,1991, Light, Medicine of the Future, Bear and Co. Inc, Santa Fe, NM. McWilliams, Charles, 1995, Photobiotics, ProMotion Publishing, San Diego, CA. Oschman, James L.,2000, Energy Medicine, the Scientific Basis, Harcout Publishers, Ltd.,Edinburgh, UK, Oschman, James L.April, 2001, Exploring the Biology of Pho totherapy, Journal of Optometric Phototherapy 4/01. Pankratov, Sergei, 1991, Meridians Conduct Light, Raum Und Zeit, Germany 1991. Russell, Walter, 1994, 3rd Edition, The Secret of Light, University of Science and Philosophy, Waynesboro, VA. Schwartz, Cheryl, 1999, Four Paws Five Directions, A guide to Chinese Medicine for Cats and Dogs. Celestial Arts, berkley, CA. Tiller, William A., 1997, Science and Human Transformation, Subtle Energies, Intentionality and Consciousness, Pavior Publishing, Walnut Creek, CA.